Railway Preservation News • View topic - Are Park Trains "Real" Trains? 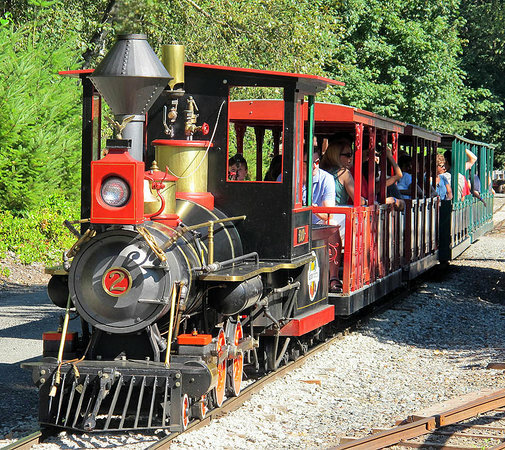 Are Park Trains "Real" Trains? Post subject: Re: Are Park Trains "Real" Trains? Additional comments: We do have a preserved locomotive, now over 100 years old. The replica coach is approaching 50 years of age, and in that respect, could be considered worthy of historic note as an interpretation of the past, in the manner of various versions of "Colonial Revival" architecture over the last 150 years or so. Fixed facilities don't look bad, either, with a weathered wood enginehouse, a decent looking water tank and station, and something you don't see much of anymore, station tracks with full planking for access. Hmm, this, Disney's original railroad in Anaheim, and Knott's Berry Farm all suggest a possible approach to a heritage railroad might be to emulate, of all things, model railroads! Think of how many model railroad builders strive for historic accuracy, and for realism, even if working to represent a fictional line. There would be worse patterns to follow. . .and think of how good an amusement park road could be if it were in such a pattern as well. . .and wasn't that the original, if unrealized, idea behind Disney's road in the 1950s? One of the interesting things about the pair of locomotives here is that they do have some touches of individuality--a classic black color scheme on one, a green paint job reminiscent of Southern Railway on the other, one with a simulated arc or carbide headlight, the other with a simulated box or kerosene headlight, one with a toolbox on the pilot, the other without. . .all in all, nicer than the average park railroad. Rather than start a new thread, I thought I would take note of this here. . .
One of my Facebook contacts posted some photos of a Western attraction called the Goldfield Ghost Town. The photos included what looked like a train ride of some sort, so I got curious and did some looking around. This attraction has a railroad all right, utilizing "real" former industrial railroad equipment--but the effect can only be described as looking like something from the lowest-budget spaghetti western you can imagine! Way off the subject of railroad preservation as most of us would think of it, but at the same time, some of this equipment is on the high side of 50 years, so. . .
A recent post on whether a historic transit operation should go with either a trolley coach or electric street railway got me curious about the Disney trolley in the representation of Los Angeles as Walt Disney first saw it. Although narrow gauge, reduced scale, and battery operated, the "feel" (i.e, interior colors, stenciling, and so on) of what amounts to a "park trolley" is quite authentic. Of course, we have to take note that Disney has more money to spend on something like this than most of us, but I seem to recall that the Pennsylvania Trolley Museum either has or had plans to recreate a street with a Pittsburgh feel to it, including an Isaly's ice cream shop. Hope they get to do that someday. How often do you find a park train patterned after an early 20th century electric elevated? Another ride, same direction, but check out the buildings, with painted signs. Post subject: Re:Are Park Trains "Real" Trains? I think some are, and some are not. To me a railroad is AAR/MCB standards used on the; wheels, flanges, couplers, brakes, all the interchange standards and other industry standard practices. So, If the park train is built following the old MCB or AAR "standard practices" (I feel ) they are real. Everyone has their "line in the sand" on these and can decide when they feel a park train is "real" or not. True to the standards park trains are very few. The McDermott built 1912 Pan American Expoistion equipment is still the standard 102 years after it was built. Second to those would be Erich Thomsen's "Redwood Valley RY" built trains, and all the 5/12 scale, 15" gauge trains he and his freinds, and others have built. Those would be the ultimate in realistic form and operation. So far. Last edited by Loco112 on Mon Dec 09, 2013 10:35 pm, edited 1 time in total. The Disney California Adventure Red Car shows how they captured a lot of the ambiance of the PE, even though the cars are more like a San Francisco Muni Type J crossed with a PE Hollywood car. Before their railway was opened, Disney brought the cast members who would be running the cars out to Orange Empire, where they practiced on PE Birney 332 (currently still "in costume" from its days as Old Pueblo Trolley 10). 332 has ties to one of Disney's competitors--it was preserved for over 20 years at MGM Studios in Culver City before coming to OERM. I see several themes among the various posts in this discussion. Park trains themselves have much variety, and you could say quite a few of them scale up to a tourist railroad with equipment that has some historical value. Others, such as the original poster's thought, was a scaled-down rough-approximation of the real thing. The thoughts on what makes it real varies from scale, approach to construction, utility in transportation, authenticity, standardization to a higher quality, and so on. In the mind of the beholder, particularly in the impression of a small child, it can be VERY real. However, all this jabber makes me wonder what is the use on this board for this discussion, when several dozen groups (in English) are dedicated to park, miniature, grand scale, and minimum gauge trains. The value to me is how real can they be for interpreting history, or a historical experience, or how much merit does a very old amusement train hold in its own historic value? In my mind there is a lot of value to using park trains as surrogate train rides at the smaller railroad museum. There is valuable history to be learned in various older installations and collections such as the MacDermott and Keystone-built equipment at Swanton Pacific. There is also a legacy of small trains being on the borderline between amusement and function. You may also be interested in a recent republication of a book about a famous railway, the Sand Hutton Light Railway, which evolved from a 15" gauge estate line to serve much in the manner (manor?) of Heywood's ideals in small agricultural transport. Well,. the Brits have plenty of small gauge railways that were built to perform real transportation functions. It seems that the question should be more focused on the purpose of the railway than the actual rolling stock itself. Note that many of the British miniature railways follow conventional operating practices, including fully functional signal boxes. One can commute on the Romney, Hythe and Dymchurch Railway and during school terms, it is used to transport students. On top of that, they run their trains consistently at speeds of 90+ scale miles an hour. Perhaps you're right; this thread goes back a little ways, before the establishment of the "Railfanning" page here. Maybe it should be moved over there. Hope you still enjoy it, though, and find some things to ponder. . .
One can commute on the Romney, Hythe and Dymchurch Railway and during school terms, it is used to transport students. Not to mention that the British Army actually used it for coastal defenses in WW2 when they thought the Germans would invade. It remains the only miniature armored train ever built for military service. Not to mention the only miniature train to shoot down an enemy aircraft. That's never been confirmed. A couple of gunners of the Somerset Light Infantry swore they hit one coming over, but I've never found any confirmation of them actually downing one. I sort of doubt it as they only had small arms. They had very large 'portable' .55 caliber semi-auto anti-tank rifles (yes, you read that right, .55 caliber) and various small arms, but nothing you'd normally use to knock down a light bomber. Anything you'll ever read on that RR will mention the 'claim of at least one downed German aircraft' and that's it.